SENDAI - When the Tohoku Rakuten Golden Eagles lost ace Hisashi Iwakuma to the major leagues in 2011, they had another, Masahiro Tanaka, waiting in the wings. The No. 1 slot in the Eagles rotation hardly missed a beat, with Tanaka going 34-4 with a 1.54 ERA in the ensuing two seasons. Tanaka is widely expected to follow Iwakuma to the majors sometime this winter, again leaving the Eagles bereft of their top pitcher, and the next name in the Rakuten pipeline is Takahiro Norimoto. 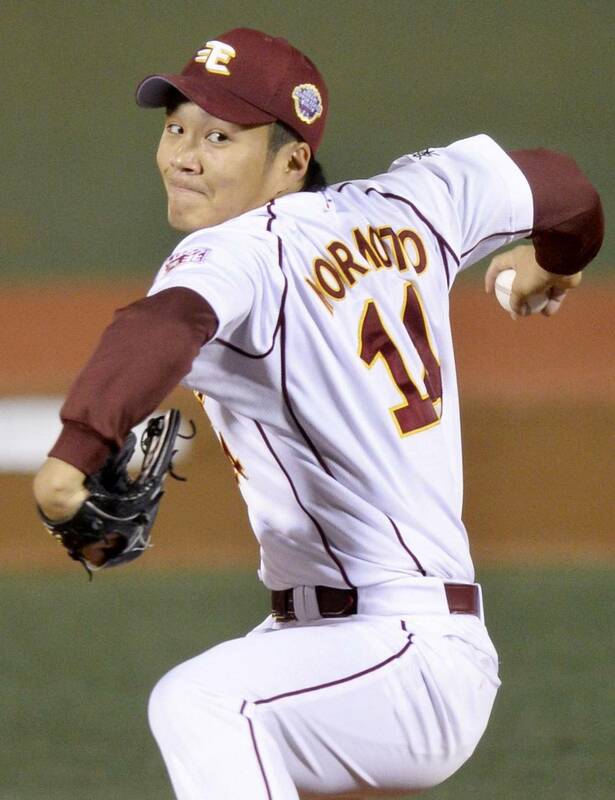 The Eagles will have some decent arms returning next season, and add draft-day darling Yuki Matsui, the highly coveted left-hander from Toko Gakuen High School, who’ll be making his transition to life on a pro mound. Even so, Norimoto figures to be the headliner when the Eagles break camp next spring and No. 18 isn’t among them. Norimoto seems to have the right stuff to take on the challenge. He was 15-5 with a 3.34 ERA as a rookie this season, and so far has allowed three runs over 17 innings during the playoffs. “He reminds me a lot of Tanaka,” said Eagles pitcher Brandon Duckworth. “He’s very mentally strong. He goes out there and he’s aggressive, and it doesn’t matter who you are, he just looks forward to beating you. That’s what’s made him so successful this year. He has tremendous stuff, and he doesn’t give in. He looked the part on Saturday night in Game 1 of the Japan Series. 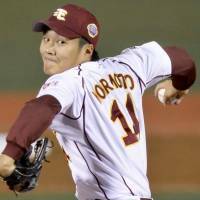 On the mound at home for the franchise’s first-ever contest in the title series, Norimoto struck out 10 and allowed just a pair of runs in a valiant eight-inning effort against the Yomiuri Giants. He joined former Giants left-hander Hisanori Takahashi as the only rookies to strike out at least 10 in a Japan Series game. “I wanted to be able to pitch on this stage,” Norimoto said afterward. The rookie relied heavily on his forkball, and lived in the high 140s with his fastball, dialing it up to 150 to get the whiff on Giants catcher Shinnosuke Abe on one occasion, and pulled out a curve ball at a few opportune times to keep the Kyojin guessing. An error helped lead to the first run he allowed and a misplaced fastball resulted in the second. That’s the type of pitching the Eagles will need if they hope to keep the ace-train moving the way it did after Iwakuma’s departure. Make no mistake, if Norimoto is indeed the face of the pitching staff going forward, there will be hurdles to overcome. He’ll have to deal with the distractions that come with stardom, and the pressure of maintaining the level Eagles fans have come to expect out of their top pitcher given how solid Iwakuma was and the sheer level of dominance Tanaka has shown, especially during a 24-0 campaign this year. The good thing for Rakuten fans is he impressed the team from the first day of spring training, and many see no reason he can’t keep moving forward. “We said that right from the start of spring training when he came in and pitched,” Duckworth said. “He pitched a little bit different than most of the others. “I think that’s the big key. He was going right after guys. Didn’t matter if it was Casey (McGehee) or AJ (Andruw Jones). Didn’t matter. It was ‘you know what, here. I’m going to see if you can beat me with this.’ That kind of separated him right out of the chute in spring training.